Welcome to the 327th edition of the Rantings of the Guild Stalker, your one stop spot to get all the juiciest tidbits. But if you hear it here, you probably didn't hear it first, unless you did--in which case I call Shaman Iguana! Well, we all lived through another week, congratulations. I feel like sometimes we as adults don't get enough credit for the small things, ya know? Particularly when adulthood can be so fraught with danger...you know like eating air freshener pizza...got stay on our toes ya'all. The most pressing piece of news for this week is this week's weekly event: Battle for Azeroth Bonus Event, which in case you didn't already know requires you to complete 4 mythic (or mythic+) BfA dungeons. Not too terrible for the reward it gives...a level 400 piece of gear! I highly recommend we all do this--particularly the raiders. Most of us can still benefit from a ilvl 400 piece. I already put out a call for some mythics this Wednesday night to help gear up Steeltruthes (so if anyone is around lets geterdone! But for the whole week if peopel need dungeons don't forget to askin guild chat, discord or facebook there are likely guildies who still need it--or would do some on an alt. Since people are likely to be running a fair number of mythics this week, I thought I would remind people that mounts have a chance to drop in Freehold, Underrot, and King's Rest and there is a pet in Temple of Sethraliss. (Plus the aforementioned engineering mount schematic in Motherlode). Additionally, if you are trying to craft your tool's of the trade item most have mats that drop from specific dungeons. In that same vein, if anyone is like me and they hate (you know with the fire of a thousand suns) the trash before Volkaal in Atal'Dazar, wowhead has compiled a nifty guide to various trash skip strategies, which I highly recommend taking a gander at. Also, a wonderful guildie (you know, one of the ones who keeps up with up-and-coming stuff----unlike myself----) sent me this link to What to Expect in Patch 8.2 this week, and I thought I would share it in case others are interested in what might be around the corner for us. The most important...if you ask me...and I know you just said, "Rho, what do you think is the most important change coming in 8.2?" ... is FLYING! That's right, pathfinder Part 2 comes out with 8.2...or so they say. We'll keep a close eye on it. The last thing I have is not exactly wow related, but tangentially wow related. So, most of you don't know this about me, but in my earlier gaming life (and I still would if I had the time) I was an AVID sims gamer...and there was this awesome post today on wowhead about someone who rebuilt main cities and the darkmoon faire in sims4. Is it really worth checking out. 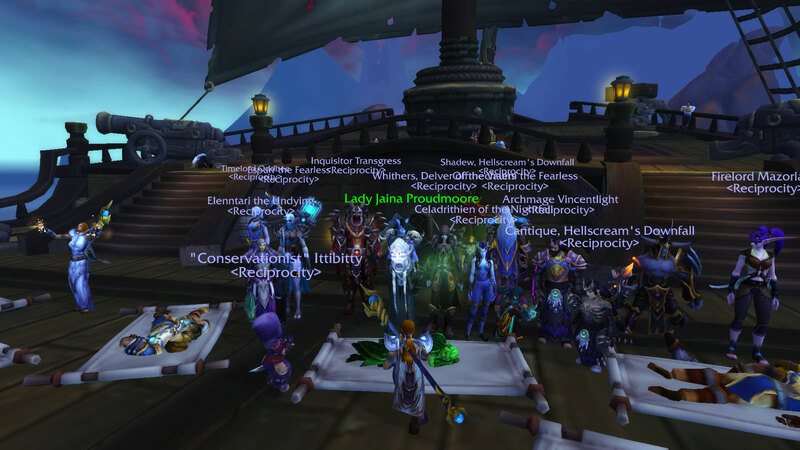 Onward guildies to the guild related news! Surdor was nominated once again for single handedly feeding the raid for at least a week or two. We really miss him in raids, but deeply appreciate that he is still helping out in what ways he can. We appreciate you more than you know Surdor. To submit a nomination, send an in-game or website mail to Rhodaria. Be sure to specify who the guildie is you are nominating and why you are nominating them. To view the gallery of past winners go to our Guildie of the Week Page. "Chaeni's wardrobe is so deep it reaches to Narina!" Submit your guesses on the website, facebook, discord or an in-game mail to Rhodaria for a chance to win even more gold. To submit a guess for GYG you can comment on this newsletter on the website or on facebook or send Rhodaria an in-game mail. To view previous weeks' challenges view the forum post. Don't forget to submit your entries to Rho with an in-game mail. Don't wanna miss out on the gold you need for that brontosaurus mount! The GCG is one of our main sources of funds for the guild, which is made possible by all of you running guild dungeons and raids. you get one entry for every checkmark you complete, just be sure to send Rhodaria a mail to submit your entry. Learn more here. A reminder that while loads of different mats are still useful, what we are hurting on and in need of the most is: Briny Flesh, herbs other than anchor weed, & Veiled Crystals. Bonus points towards the monthly Mat Battle will be given for supplying these items. Don't forget these donations should be sent to Oddbee! Most of you know this, and I try to post things in all places, but not everything makes it everywhere, so I wanted to take a brief moment and remind everyone of what all we have. We have a guild facebook page. It is a closed group, so you have to ask permission (just include your toon name or message me to tell me you applied) or give me your name and I can invite you. Guildies frequently post memes, fun videos (wow and non wow related) and things that people might find interesting. I also post links to the newsletter and raid rosters. Additionally, I wanted to remind people, in part because more people are playing little horde druids now, that we have a cross server--cross faction guild chat as well. 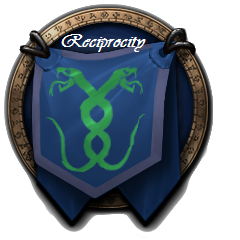 Or you know if you're on your lowbie guild bank toon...whatever...it is just another way for us to stay in contact. If you're not already a part of the group you can join it https://blizzard.com/invite/dyakv2bf0vb there. In other good (and I am totally on top of it news) I have posted April raids. They are in the in-game calendar as well as on the website here. I like it because my phone is currently too old to pull up the WoW Companion App and I sometimes want to look at the calendar without logging in, so I did that. I would also like people to notice that the first two weeks of April raids will be similar to what we have been doing (in terms of what content we do what nights). But Crucible of Storms releases on the 16th and we will adjust our schedule then. I have put it on Tuesday to start since that is when we have our most people, but would like to possible rotate Tuesday and Saturday nights. We will see how it plays out. In addition, we will keep Sundays as normal catch-up night where we will jut rotate through what we clear one week and hold the lock out till the next week. Please make sure you sign up for raids as it makes Rho's life a lot easier.